5 the beginning of these Regulations; and may, in the light of this review, be transferred from one programme to another (e.g. MEng to BEng). At any stage, a student who fails to meet the progress regulations will be considered for the early exit awards of Dip. H.E. and Cert. H.E. To remain matriculated for any degree, a student must: (i) in the preceding session, achieve a grade point average of at least 10 over courses corresponding to 60 credits for full time students, or half the credits studied for part time students; (ii) not exceed the permitted maximum number of re-assessments as stipulated in section 2 of these regulations; (iii) normally have obtained the Certificate of Basic IT Competence in his or her first session in order to progress to subsequent sessions of study and to qualify for any award covered by these regulations Candidates for BEng or BSc(Hons) In addition to the foregoing requirements, a candidate for BEng or BSc(Hons) must reach the following standard in the preceding year of the curriculum 1 in order to progress to the next year of the curriculum 1 : (i) at least a grade E in all courses; (ii) a grade point average of at least 10. Students who fail to satisfy progress requirements (iv) and/or (v) may not proceed to the next year of the curriculum. 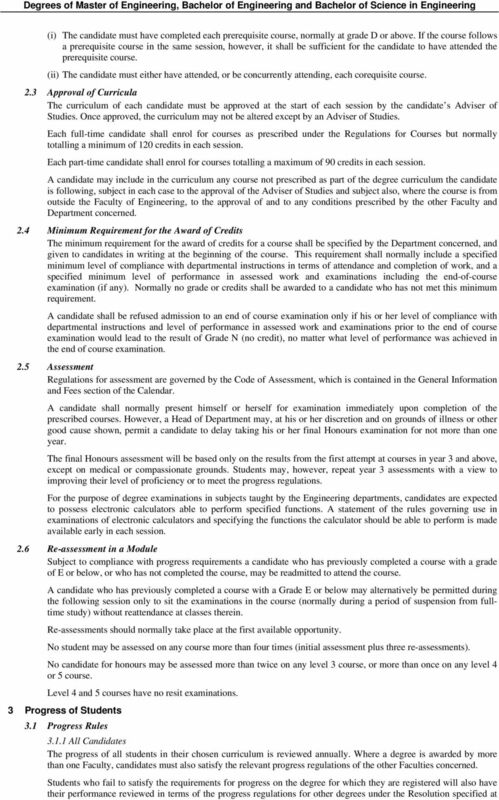 Such students must repeat courses if permitted or will be transferred to the BSc(Ord) curriculum Candidates for MEng In addition to the foregoing requirements, a candidate for MEng must reach the following standard in order to progress to the next year of the curriculum: (iii) achieve a grade point average of 13 in the preceding year of the curriculum 1. A student who fails to meet the progress requirement at entry to years 2, 3 or 4 will be considered for the corresponding BEng or BSc(Hons) programme. A student who fails to meet the progress requirement at entry to year 5 will be required to complete any missing components of the corresponding BEng or BSc(Hons) programme and will then be considered for the degree of BEng or BSc(Hons) in the normal way 2. A student who fails to complete the curriculum of year 5, or whose overall performance falls below the standard required for the MEng degree, will be required to complete any missing components of the corresponding BEng or BSc(Hons) programme and will then be considered for the degree of BEng or BSc(Hons) in the normal way 3. 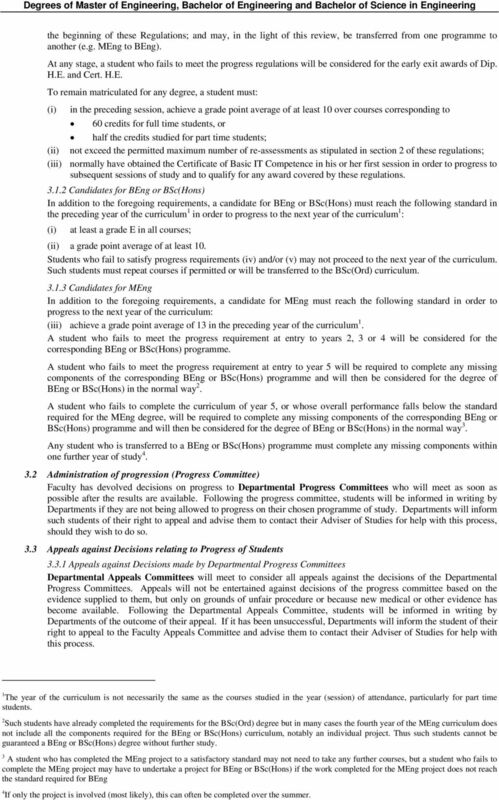 Any student who is transferred to a BEng or BSc(Hons) programme must complete any missing components within one further year of study Administration of progression (Progress Committee) Faculty has devolved decisions on progress to Departmental Progress Committees who will meet as soon as possible after the results are available. Following the progress committee, students will be informed in writing by Departments if they are not being allowed to progress on their chosen programme of study. Departments will inform such students of their right to appeal and advise them to contact their Adviser of Studies for help with this process, should they wish to do so. 3.3 Appeals against Decisions relating to Progress of Students Appeals against Decisions made by Departmental Progress Committees Departmental Appeals Committees will meet to consider all appeals against the decisions of the Departmental Progress Committees. Appeals will not be entertained against decisions of the progress committee based on the evidence supplied to them, but only on grounds of unfair procedure or because new medical or other evidence has become available. Following the Departmental Appeals Committee, students will be informed in writing by Departments of the outcome of their appeal. If it has been unsuccessful, Departments will inform the student of their right to appeal to the Faculty Appeals Committee and advise them to contact their Adviser of Studies for help with this process. 1 The year of the curriculum is not necessarily the same as the courses studied in the year (session) of attendance, particularly for part time students. 2 Such students have already completed the requirements for the BSc(Ord) degree but in many cases the fourth year of the MEng curriculum does not include all the components required for the BEng or BSc(Hons) curriculum, notably an individual project. Thus such students cannot be guaranteed a BEng or BSc(Hons) degree without further study. 3 A student who has completed the MEng project to a satisfactory standard may not need to take any further courses, but a student who fails to complete the MEng project may have to undertake a project for BEng or BSc(Hons) if the work completed for the MEng project does not reach the standard required for BEng 4 If only the project is involved (most likely), this can often be completed over the summer. 6 3.3.2 Appeals against Decisions made by Departmental Appeals Committees The Faculty Appeals Committee will follow the procedures laid down in the Faculty Appeals Code in the General section of the Calendar. 4 Specific Structure of the Degree and Sub-Degree Awards 4.1 Minimum Requirements for the awards MEng, BEng and BSc(Hons) Candidates for the degrees of MEng, BEng and BSc(Hons) must complete courses totalling at least 480 credits for the Bachelor s degrees and at least 600 credits for the Master s degree. Subjects in which the degrees may be awarded are listed in section 4.3 and curricula are laid out in Departmental Undergraduate Student Handbooks. There shall be four classes of Honours as follows for the Degrees of MEng, BEng and BSc(Hons) in Engineering, to be called the First, Upper Second, Lower Second and Third Classes, respectively. The Second Class of Honours shall be divided into two divisions (Upper Second and Lower Second). The degrees may also be awarded as Unclassified Honours Degrees. Candidates failing to meet the minimum requirements for the Degree of MEng may be considered for any classification of the BEng or BSc in Engineering Degrees, including non-honours Degrees. The names of the candidates placed in each class or division as the case may be, shall be arranged in alphabetical order. The Board of Examiners will award a class of Honours based on a weighted average of marks normally comprising those for the courses of Years 3 and 4 of the Degree of BEng and of the Degree of BSc with Honours in Engineering and the courses of Years 3, 4 and 5 of the Degree of MEng with a higher weighting being given to the final year in each case. The weighting for each degree curriculum will be published in the appropriate Departmental Undergraduate Student Handbook. In making the award, the Board of Examiners may also have regard to the candidate s performance throughout the curriculum. The examination marks used in calculating the weighted average will be indicated annually to students in the appropriate Departmental Undergraduate Student Handbook. In the case of Joint Honours the Joint Board of Examiners shall be entitled to set a minimum standard in either of the combined subjects to qualify the candidate for a particular class of Honours Pass Degree A Pass Degree is a non-honours Degree which may be awarded to a candidate who has completed an Honours curriculum but failed to meet the required standard. Candidates failing to meet the Honours standard may be awarded a BEng Pass Degree or a BSc in Engineering Pass Degree BSc(Ord) A candidate for the Degree of BSc(Ord) must satisfy the following minimum requirements: (i) (ii) Courses must be completed with a grade point average of at least 10 over 360 credits, including any compulsory courses. Courses at Level 3 or above, including any compulsory courses, must be completed with a grade point average of at least 10 over: 80 credits for a single subject, or 40 credits in each of the two subjects for a joint subject. Compulsory courses for each subject and any other special requirements are specified in Departmental Undergraduate Student Handbooks. This Degree may be awarded with Merit if the candidate has a grade point average of at least 12, or with Distinction if the candidate has a grade point average of at least 14, over each of the minimum sets of credits specified in requirements (i) and (ii). This Degree is offered in the same subjects as those listed for Honours Degrees DipHE(Engineering Studies) To qualify for the DipHE, the candidate must satisfy the following requirements: (i) (ii) Successful completion of or exemption from courses corresponding to at least 240 credits. Successful completion of courses above Level 1 corresponding to at least 90 credits. (iii) At least 120 of the credits must correspond to courses in Engineering subjects. (iv) Candidates with no exemptions at entry must achieve a Grade Point Average of at least 8.5 over at least 240 credits. 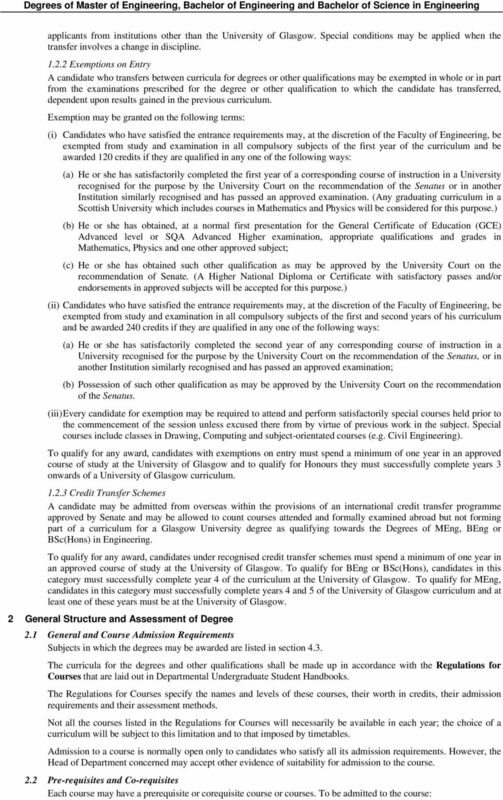 (v) Candidates awarded credit at entry under the provisions of section 1.2 must achieve a Grade Point Average of at least 8.5 over at least 120 credits obtained on the basis of courses completed at the University of Glasgow. This Diploma is offered only in Engineering Studies. There are no designated diplomas CertHE(Engineering Studies) To qualify for the CertHE the candidate must satisfy the following requirements: (i) Successful completion of courses totalling at least 120 credits. 8 Electronics with Music Avionics (administered by the Department of Aerospace Engineering) Electronic and Software Engineering Electronic Engineering and Physics Mechanical Engineering MEng in: Mechanical Engineering Mechanical Engineering - Accelerated Route Mechanical Engineering (European Curriculum) Mechanical Engineering (European Curriculum) - Accelerated Route Mechanical Engineering with Aeronautics Mechanical Engineering with Aeronautics - Accelerated Route Mechanical Engineering with Electrical Engineering Mechanical Engineering with Electrical Engineering - Accelerated Route Mechanical Design Engineering Mechanical Design Engineering - Accelerated Route BEng in: Mechanical Engineering Mechanical Engineering (European Curriculum) Mechanical Engineering with Aeronautics Mechanical Engineering with Electrical Engineering Mechanical Design Engineering BSc(Hons) in: Mechanical Engineering Mechanical Engineering (European Curriculum) Mechanical Engineering with Aeronautics Mechanical Engineering with Electrical Engineering Mechanical Design Engineering Specialisation in Engineering Management Candidates will be regarded as having specialised in Engineering Management if they have: (a) completed a graduating curriculum under the foregoing rules in any branch; (b) included in their graduating curriculum an approved minimum of 80 credits, all completed at a minimum of Band D level, from a list of Selected Subjects available in the appropriate Departmental Undergraduate Student Handbook Naval Architecture and Ocean Engineering In August 2001, the Department of Naval Architecture and Ocean Engineering, University of Glasgow and the Department of Ship and Marine Technology, University of Strathclyde merged to form the Department of Naval Architecture and Marine Engineering. 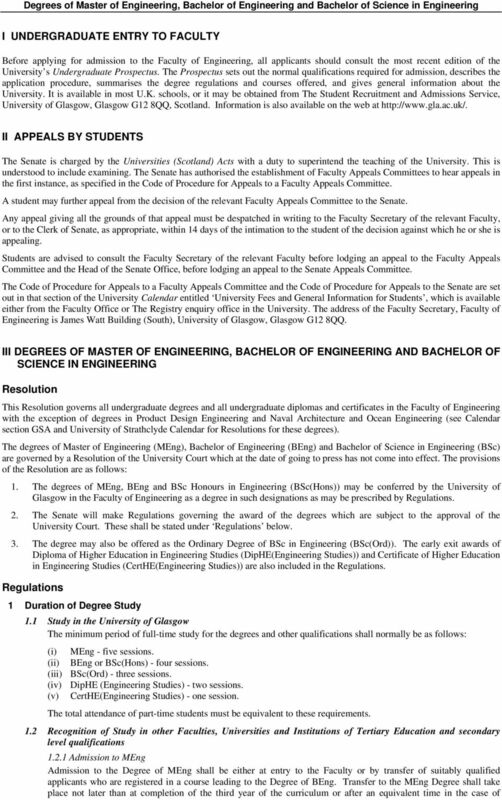 The regulations for Degree Programmes and Higher Degrees offered by the merged Department apply to students who commenced study after October 2001 and are detailed in the University of Strathclyde Calendar. 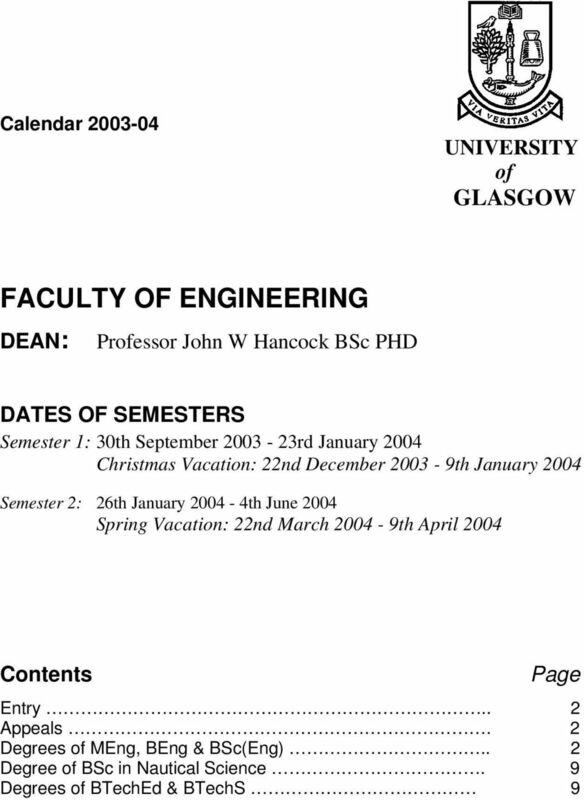 Students registered at the University of Glasgow prior to October 2001, who wish to graduate with a Glasgow degree, should consult the Regulations in the edition of the University of Glasgow Calendar. 9 Degree of Bachelor of Science in Nautical Science Degree of Bachelor of Science in Nautical Science Since the merger described above, undergraduate teaching of students of the merged department has taken place on the John Anderson Campus, University of Strathclyde. Students undertaking the Degree of Bachelor of Science in Nautical Science therefore attend courses at the University of Strathclyde and the Glasgow College of Nautical Studies. 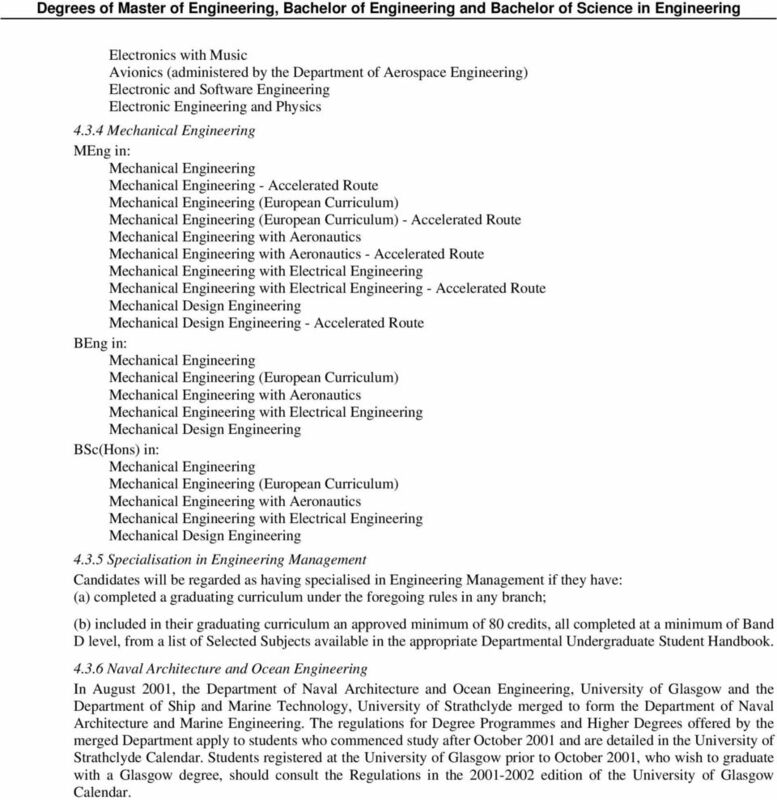 From Session 2003/04 the Regulations for this Degree Programme are detailed in the Calendar of the University of Strathclyde. 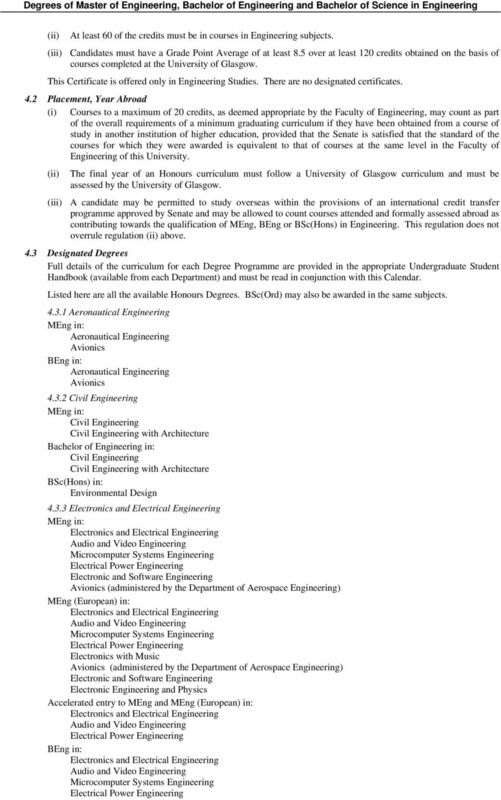 Students registered at the University of Glasgow prior to Session 2003/04 should consult the Regulations in the edition of the Calendar of the University of Glasgow Degrees of Bachelor of Technological Education & Bachelor of Technology Studies From October 2002, students entering the Degrees of Bachelor of Technological Education (BTechEd) and Bachelor of Technology Studies (BTechS) will be matriculated in the Faculty of Education. Students admitted to the Degree before October 2002 will continue to be matriculated in the Faculty of Engineering. Both groups of students should refer to the Faculty of Education section of this Calendar.